When you're always using computers it's best if you have accessories fit for your specific requirements because each user has their own length of usage, kind of usage and needs. This is the reason why stores have various kinds where you can select which is right for you. 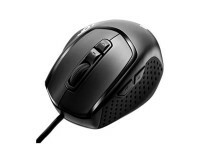 Found this CoolerMaster Storm Xornet mouse at pc express online store which offers a good choice for minimalistic gamers. This newly-marketed mouse is ergonomically designed, lightweight and specifically designed for smooth in-game and precise movements. Some Specifications: rubber grip material, 2000 DPI storm tactical optical sensor, 160 IPS tracking speed, right hand ergonomic, 5 mouse buttons+ 2 fix function buttons. 142 g. Sells at PhP995 at pc express phils.